“I remember the first time I walked into the Waldorf in New York. I was a teenager. It was majestic and formal, and I was fascinated with how all the layers worked together — the Art Deco motifs, the Art Nouveau approach and the strong formality of the Waldorf. Speaking to us in Waldorf Astoria Bangkok’s palatial two-bedroom suite is the sharply suited André Fu, the architect and designer wunderkind of luxury hotels such as Upper House Hotel in Hong Kong, The Berkeley London’s Pavilion Suites and, on local shores, The Fullerton Bay Hotel. Together with his Hong Kong based design studio AFSO, Fu spearheaded the hotel’s design, with the exception of the top three food and beverage floors, which were designed by New York-based AvroKO. 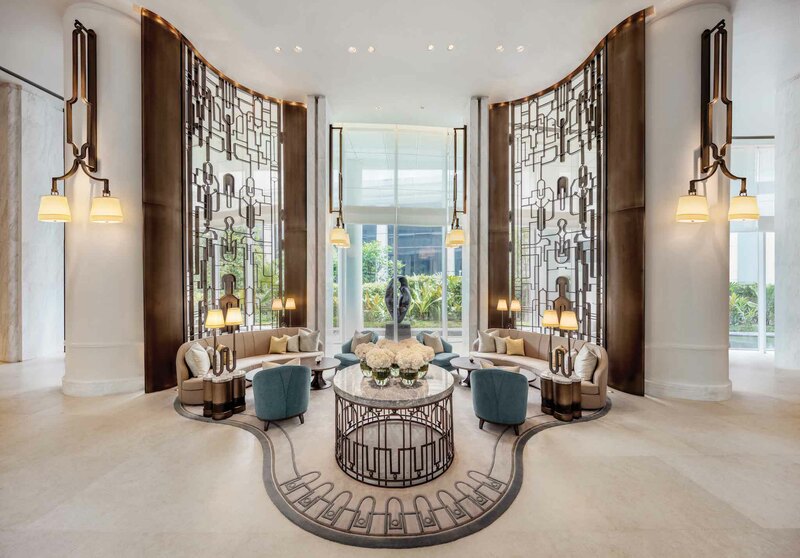 Our experience of walking into Waldorf Astoria Bangkok hotel is akin to Fu’s — we arrive at the gleaming marble steps of the property enthralled. Located at Magnolias Ratchadamri Boulevard, the towering design reinterprets a magnolia’s form and dramatically unfolds upwards like freshly bloomed petals. As the first Waldorf in Southeast Asia, its sculptural shape instantly makes a distinctive addition to the Bangkok skyline, and an impressive entrance into the region too. Stepping into the lobby, one immediately sees where the Bangkok outpost differs from its iconic flagship in New York. While neoclassical design, audacious Art Deco accents and historic features take centerstage at the original property, its Thai counterpart adopts a more contemporary expression. Fu pinpoints the element of fluidity as the key trait that bridged the hotel’s legacy with its locale. “I tried to translate the magnolia and the hotel’s architecture into this sense of fluidity that inspires me about Thai culture. In doing so, I thought about the classical Thai dancer and the way the hand moves, and how they dance and turn. The motifs on the screens located around the hotel are shaped to look like the dancer’s fingers with the long nails curling up, like a welcome hand gesture,” Fu tells Prestige Online. Beckoning guests in at the Upper Lobby are floor-to-ceiling bronze screens which combine the finger silhouettes of Thai dancers with Art Deco motifs from the flagship property. Similarly, this motif is seen at Peacock Alley, a Waldorf Astoria staple. Behind the marble bar is a bronze oversized handmade clock lattice — an homage to the iconic clock of the flagship hotel — which repeats these motifs. Elsewhere in the hotel, furnishings pay tribute to local culture. Timber bar cabinets in the rooms are topped with pagoda-shaped baskets; room numberings are made in cast bronze by local artisans. These sit alongside high-tech features such as a touch-screen remote control and soothing interiors, against the backdrop of carpet patterns that feature the same fluid motifs. In public spaces, Front Room highlights the unique DNA of the hotel. The eight-metre high dining venue is framed by a ceiling lighting installation of 200 glass lanterns which symbolise the floating lanterns during Yi Peng Festival in Northern Thailand. Welk highlights the example of the hotel’s two watering holes as a shining example. On its highest floor is its Champagne Bar — like the fabulous, famous speakeasies of the world, it boasts a mysterious entrance and passageway that leads to a sleek, sophisticated space surrounded by views of the glittering cityscape. Access is only available upon pressing a secret button on its striking bejewelled door. “We’re taking the legacy of Waldorf Astoria and combining it with the vibrancy of a city like Bangkok,” Welk says. A floor below the bar and the grand gilded staircase is The Loft: A bar appointed in in Art Nouveau design, which serves classic cocktails made with artisanal spirits and house-made ingredients. Tipples here feature a local edge; its signature The Waldorf combines Michter’s Bourbon, Thai Basil-Mancino Sweet Vermouth, chocolate bitters and coriander. Helmed by Chef de Cuisine Fae Rungthiwa Chummongkhon, whose experience stems from Michelin-starred restaurants across Europe, the restaurant melds fresh, locally sourced Thai ingredients and Nordic cooking styles. According to Welk, Bangkok was the most frequently visited city in the globe last year — luxury travel is also finally shifting to Asia Pacific. This bodes well for the hotel; Welk wants to leave behind a “sensational legacy, and have Waldorf Astoria Bangkok host the pioneers of the luxury travellers of tomorrow.” From what we’ve experienced, the hotel is well on its way there. This article was first published on Prestige Online.